To be finally able to write about this project is a huge relief because I have been bursting to talk about it whenever I caught anybunny who would listen. There is a sense of pride bubbling from myself. It began with Amanda Cathleen‘s inspiration to comfort a friend who can be found in a dictionary as the definition of generosity. In November of 2006, Cathy of “Tightly Wound Loosely Knit” organized a blanket to be made for her friend Jenn. Jenn had suffered through a long stretch of pain and Cathy requested for blanket squares to be donate. 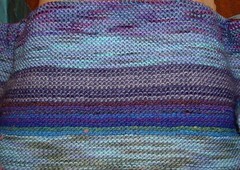 Not hesitating, I helped out and knitted two squares. A year later, Cathy’s luck drew the short straw and her health was hit with mis-diagnosed cancer. Seeing her friend’s situation, Amanda Cathleen contacted those of us who helped in Jenn’s blanket in the hopes that we might be interested. To her amazed surprise, over twenty knitters volunteered, and thus the traveling shawl began. 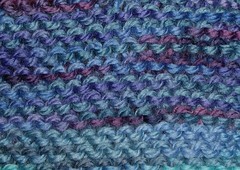 The pattern was simple with its 255 stitch cast on garter stitch. 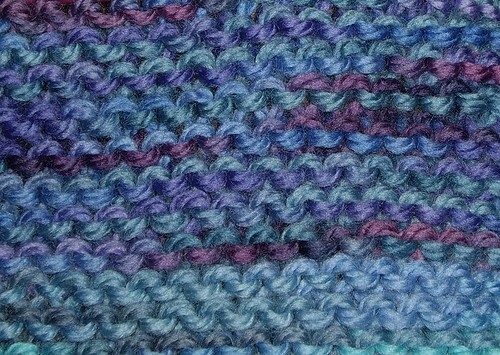 Each of us would knit a set of rows in a blue (but not royal blue) superwash worsted weight wool. 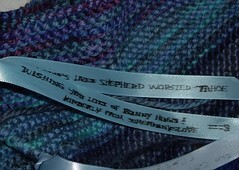 My choice was an easy one — Lorna’s Laces Shepherd Worsted in the Tahoe colorway. I knew that the soft blue highlighted with the purple would please Cathy. 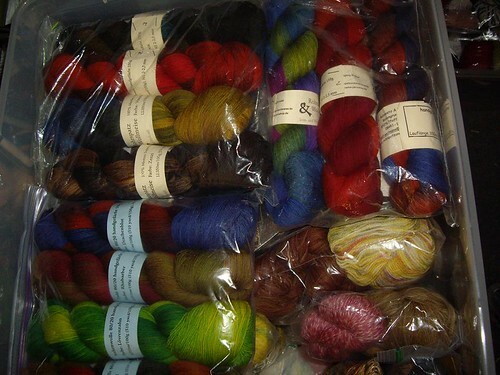 I had received the yarn in swap from the wonderful gcclfar on Ravelry. 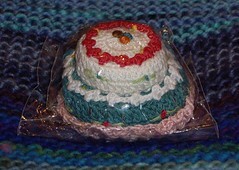 After knitting my strip, I included a little tape measure for Cathy. As all fibery crafters know, tape measures disappear like the dickens, so one can never have too many. Here is the incentive: For the most bunnies made, I will offer a skein of Wollmeise of choice in red (Indisch Rot), blue (Vincent), or green (Frosch) to the winner. *ETA* If only 1 bunny is made from all the participants, then a drawing will be held. Likewise, if there is more than 1 person who made the same number of chocolate bunnies, a drawing for those knitters will be done. Wow, what an awesome prize! If I didn’t have SO many things to do right now I’d join in! I think it’s really lovely what you did Cathy and Jenn. I know that must have been greatly appreciated. how adorable! i know i have some wool of the andes in a perfect chocolate shade somewhere – count me in! What wonderful projects. 🙂 Good luck! No, animals are not toys.. I can’t thank you enough for joining in on my crazy scheme and going along for the ride! The yarn that you picked out is beautiful, it took me a long time to weave in all the ends. Not because there was a lot of them, but because I was looking at the yarn that each person choose! I am fairly new to Ravelry and stumbled upon this today. Count me in for a number of reasons: I agree that bunnies are not toys (or to eat for that matter! ), the pattern looks like fun, and, I want to win that prize!